Each week we are sharing a new Small Grant School Story. These stories offer a peak into the inner workings of a day at a ‪#‎TEG‬ small grant school, as well as being a repository of all the information we have gathered while working with the school. Our second instalment has us visiting Champlain Heights Community Elementary School, as we learn about Champlain’s move from informal use of planters on school grounds, to indoor seed starting & hands-on learning opportunities for all students. Champlain Heights Elementary is located in the southeast corner of Vancouver on “expansive, park-like grounds”. The school has approximately 250 students from K-7 in the main building, in addition to the separate Champlain Heights Annex. “Students who attend Champlain Heights School are drawn from a catchment area of moderate to higher density housing, consisting of townhouses, single family homes, housing cooperatives, rental and subsidized housing. Approximately 25% of [the students] speak English as a second language, with Chinese, Korean, Tagalog and Spanish being the most common first languages spoken other than English.” Approximately 10% of the school population is First Nations. (Champlain Heights School Plan, 2012, Web). 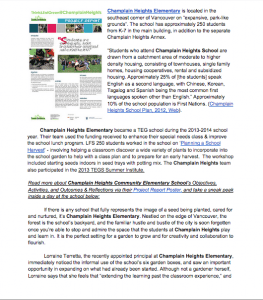 Champlain Heights Elementary became a TEG school during the 2013-2014 school year. Their team used the funding received to enhance their special needs class & improve the school lunch program. 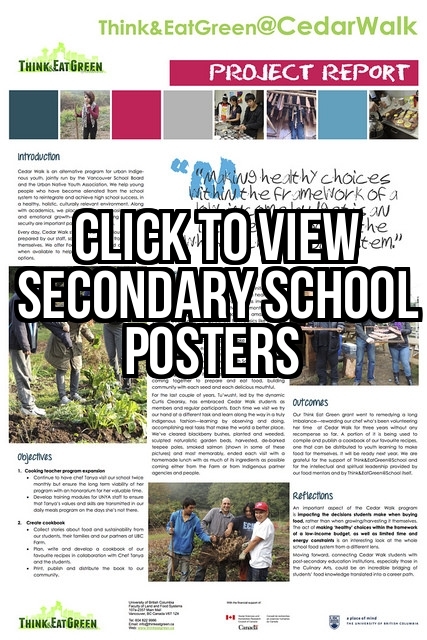 LFS 250 students worked in the school on ‘Planning a School Harvest’ – involving helping a classroom discover a wide variety of plants to incorporate into the school garden to help with a class plan and to prepare for an early harvest. The workshop included starting seeds indoors in seed trays with potting mix. The Champlain Heights team also participated in the 2013 TEGS Summer Institute. If there is any school that fully represents the image of a seed being planted, cared for and nurtured, it’s Champlain Heights Elementary. Nestled on the edge of Vancouver, the forest is the school’s backyard, and the familiar hustle and bustle of the city is soon forgotten once you’re able to stop and admire the space that the students at Champlain Heights play and learn in. It is the perfect setting for a garden to grow and for creativity and collaboration to flourish. Lorraine Terretta, the recently appointed principal at Champlain Heights Elementary, immediately noticed the informal use of the school’s six garden boxes, and saw an important opportunity in expanding on what had already been started. Although not a gardener herself, Lorraine says that she feels that “extending the learning past the classroom experience,” and “increasing ‘hands-on-learning’ opportunities for students,” are both integral to the learning process and an experience that she fully supports for all the students. After attending the Think&EatGreen@School meeting in the fall, and learning about the many projects happening in other schools – all at different scales and stages in their work on integrating the complete food cycle into the classroom – Lorraine realized that with a bit of funding, the school could focus their efforts on upgrading the current planter boxes, and integrating school food system activities further into the classroom setting. 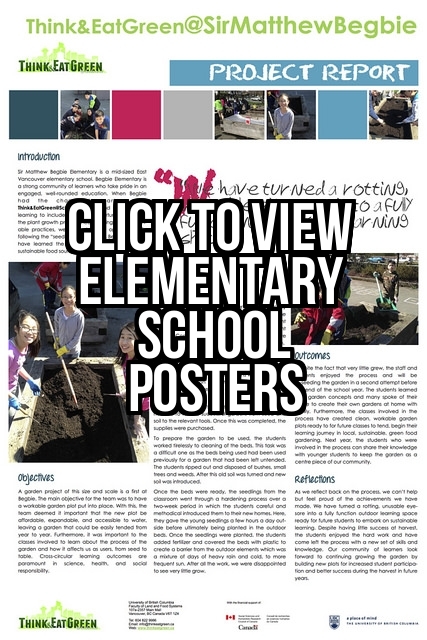 With the Think&EatGreen@School funding, the school purchased soil, new gardening tools and seeds which have already been started in the classrooms. Access to tools was identified as a real need because teachers were having a hard time sourcing tools, and enough of them, so that all of the students could use them at the same time. Not only that, but the students are now planting their seeds in proper seed trays with greenhouse covers, and have a wider variety of seeds to choose from. 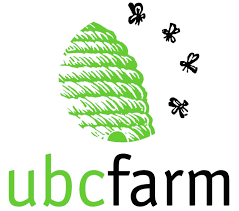 By the end of June 2014, the goal was to integrate the food from the boxes into the classrooms, with the idea that vegetables will be growing throughout the summer and into the fall for next year’s students. In terms of integrating the complete food cycle into the classroom, Lorraine felt that that’s where the opportunity lies for her and her team. Two of the school’s teachers were the pilot classes for Growing Chefs!, a non-profit organization in Vancouver that works to bring hands-on learning into the classroom, and teaches students about growing and cooking their own food (even in the city!). That was almost ten years ago, and since then Growing Chefs! has been back to the school to teach the students more about the complete food cycle. Lorraine is also excited to have three worm compost bins set up in some of the classrooms, for further integration of the complete food cycle into the school space. Although Champlain Heights may be at the very beginning stages of formally integrating the complete food cycle into the classroom setting, Lorraine and her team seem to be the right people for the job. By using past knowledge and current connections through Growing Chefs!, as well as building on the infrastructure already in place, the staff and students at Champlain Heights Elementary are well on their way to building a way of knowing that can be sustained and cherished by future classes and the surrounding community. The seed has been planted and the idea has been nourished – now we must wait and watch it grow.